Part 9: Optimistic isolation levels – TANSTAAFL! Part 10: What isolation level should I choose? This entry was posted in General and tagged Locking on September 28, 2011 by Dmitri Korotkevitch. Wrapping up.. Only remaining question is “What isolation level is good for me”? And there is no right answer to that question. As usual, it depends. I’ll try to summarize a few things but again, think about specific details of your system and make decision based on them, not on generic advices below. When you start to think what isolation level should you use in your system, there are 2 questions you need to answer. First, what is the blueprint of your system – is it OLTP or Data Warehouse type system? OLTP systems usually handles operational activity of the company and serves high volume of short identical queries and short transactions. Data Warehouse blueprint described reporting type system with low volume of long transactions and complex queries. In OLTP systems data is constantly changing, in Data Warehouse systems it rarely the case – data usually updates on the batches based on some schedule. As the example, let’s think about online store. The database that handles customer facing shopping cart web site is OLTP. There are always new orders coming, existing order updating, customers check the status of existing orders, search the article lists, etc – those are done within short transactions and simple queries. Assuming same time company executives want to run some reports, see some trends and other analysis – there is the good chance that it would be another database for that purpose. This database would be optimized for complex reporting and data in that database could be refreshed every night or perhaps on the weekly basis. That database is Data Warehouse. In real life, of course, it’s rarely the case. 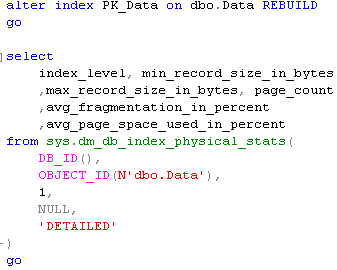 There is always some reporting activity against OLTP database but in any case, you can see what blueprint fits better. And it leads to the second question you need to answer: “How much data consistency do I really need?”. And even if the answer “I don’t need any consistency” is quite popular, it rarely the case in the real life. So let’s dive a little bit more in “no-consistency” mode. No-consistency in terms of transaction isolation levels mean read uncommitted. Either directly as “set transaction isolation level” or with (NOLOCK) hints. There are some cases when you can decide to use that isolation level – for example, in our system we have a few transaction entities where data has been inserting to our system and never ever updating/deleting after that. Same time, clients are constantly downloading the data and we don’t really care if clients get the data from uncommitted transaction. This is the case when we can downgrade to read uncommitted isolation level to reduce the blocking for the client downloading sessions. read uncommitted. In that mode writers also don’t block readers and same time give you statement level consistency. Of course there are some performance implications but in most part of the cases you can live with them. 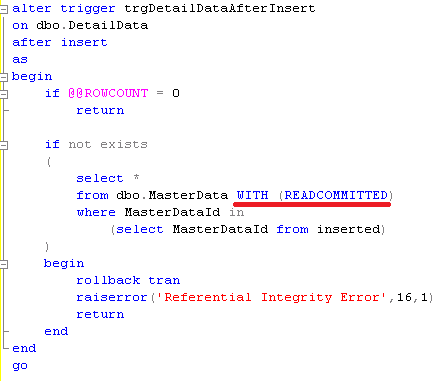 Read committed, which is also default isolation level, in most part of the cases (again, assuming the system is more or less optimized) – this is the good choice especially for OLTP systems. It gives you acceptable compromise between consistency and concurrency. Again, there is blocking involved but when system is optimized – it’s minimal. Speaking of higher isolation levels – repeatable reads and serializable – those are typically bad choice for OLTP. For reporting and data warehouse systems those could be acceptable but same time for such systems optimistic isolation levels (read committed snapshot and snapshot) are better. And speaking of optimistic isolation levels. 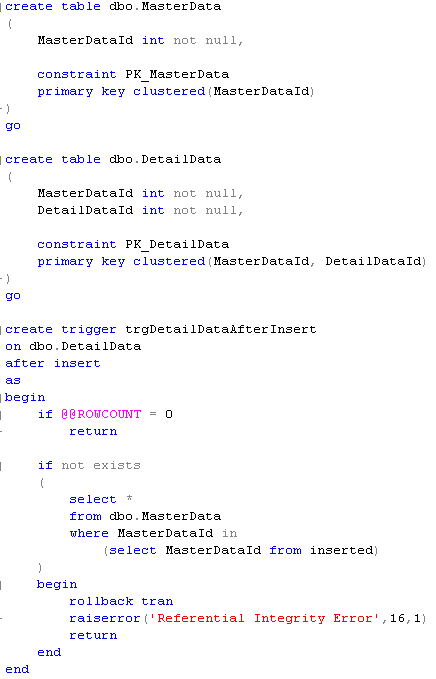 For Data Warehouse type systems – use them. I don’t think about any single reason why you would like to avoid them in such systems. For OLTP – consider them. If you can live with performance overhead – it could be the good choice. Be careful – don’t forget about extra 14 bytes and don’t use fillfactor = 100 though. So, the bottom line. For Data Warehouse – use optimistic isolation levels whenever possible. Only case with Data Warehouse systems when I would suggest to consider different options is when data in the system updates on the real time. And even in such case give optimistic isolation levels the try. For OLTP – if you can use optimistic isolation levels – use them (start with read committed snapshot). If not, use read committed and optimize the queries. Don’t use read uncommitted and (nolock) hints unless you don’t care at all about consistency. And definitely don’t use read uncommitted to reduce blocking. This is the bad choice. This entry was posted in General, SQL Server 2005, SQL Server 2008 on September 26, 2011 by Dmitri Korotkevitch. Two week ago we discussed 2 “optimistic” transaction isolation levels – Snapshot and Read Committed Snapshot. We already saw how those isolation levels can provide us transaction and statement level consistency reducing blocking issues same time. Sounds too good to be true.. So does it make sense to switch to optimistic isolation levels? Well, the answer is typical – “it depends”. There are a few things you need to keep in mind before you make the decision. 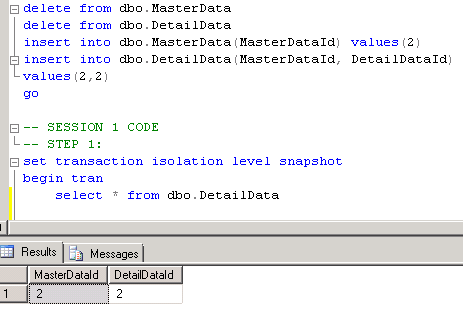 Let’s talk about them from both – DBA and Database Developer standpoints. First of all, as we already know, optimistic isolation levels use tempdb for the version store. When you modified the row, one or more old versions of the row is stored in tempdb. This leads to the higher tempdb load as well as to the larger tempdb size. Would it be the issue for your system? Again, it depends. As the bare minimum you should reserve enough space for tempdb and closely monitor the load. There are a few performance counters under <SqlInstance>:Transactions section that related to the version store – they will show you version store size, generation and cleanup rates and a few other parameters. Those are very useful and I recommend to add them to your baseline. Second thing you need to keep in mind is that SQL Server needs to store additional 14 bytes pointer to the version store in the. It’s not only increasing the row size, it also can introduce page splits. Let’s take a look. Let’s use the same database from the last blog post – you can download it from the last post. Let’s rebuild the index (with default FILLFACTOR=100) and look at the index statistics (click on the image to open it in the different window). As you can see, it has 0% fragmentation. Row size is 215 bytes. 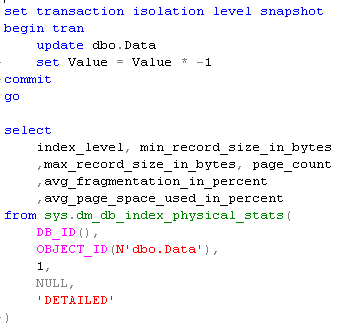 Now let’s run transaction in snapshot isolation level and update Value column. This is integer (fixed width column) so this update by itself should not increase row size. If you look at the index statistics now, you can see that there were heavy page splits and row size increased by 14 bytes. Those 14 bytes is the pointer to the version store. The bottom line – if you use optimistic isolation level, don’t use 100% fillfactor for the indexes. Now let’s move to more complex scenario and 2 sessions. First, let’s start transaction in the 1st session and check if we have MasterData row. Let’s keep transaction open and in the second session let’s delete master data row. As you see everything is just fine. 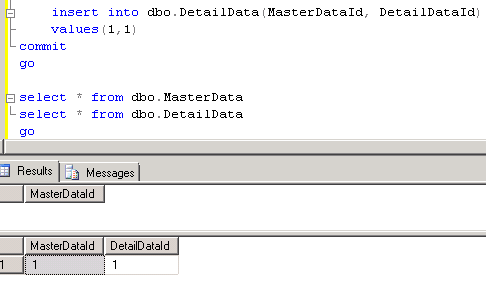 Next, lets come back to the first session and insert detail row that references the master row – as you can see there is no errors but referential integrity has been compromised. It happens because inside the trigger we still are in the context of the old transaction where we reference old version of MasterData row from the version store. This could be easily fixed in the trigger by using (READCOMMITTED) query hint but of course you should remember it and modify the code. It worth to mention that regular referential integrity based on foreign keys uses read committed isolation level by default. And now let’s try to update the same row from the first session and commit the transaction. As you can see, behavior is completely different from the regular pessimistic isolation levels – it raises the exception. So obviously the client application needs to catch those errors and either notify users or implement some sort of retry logic to handle it. 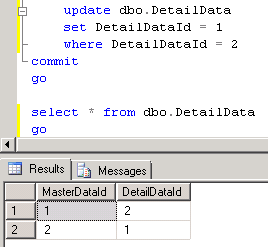 Next, in another session let’s run update that changes DetailDataId to 2 for the first row. As you see, because of the row versioning it simply swaps the values. It would be completely different with regular pessimistic isolation levels when one session would be blocked and next update either 0 or 2 rows (depend on what session acquires the lock first). The bottom line – if you move your application to snapshot isolation level, you need to test how it would behave in environment with the multiple users. Otherwise you’d have a few nice side effects. There are different behaviors for updates when multiple sessions update the same rows and when scan is involved. Part 10 – What isolation level should I choose? This entry was posted in General, SQL Server 2005, SQL Server 2008 on September 8, 2011 by Dmitri Korotkevitch.